darkSpyro - Spyro and Skylanders Forum - Skylanders Toys and Merchandise - Anyone still collecting? darkSpyro - Spyro and Skylanders Forum > Skylanders Toys and Merchandise > Anyone still collecting? 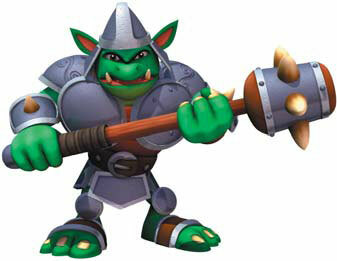 Hi all, as the title states, are there still avid collectors of skylanders out there? My wife and I started day one and basically have almost every character besides the chase/metalics/flocked/etc. Hope to hear that there are still people out there as excited as us about collecting! That's awesome, tytra! I knew I never had a chance at employee versions or most of the chase figures (although I got a couple of chase figures that popped up on Gamestop.com from time to time). But I have every standard release toy including things like volcanic vault, UFO hat and yawn traps. Beyond that I have two E3 exclusive figures (Riot Shield Shredder trap and event exclusive Hot Streak) since those show up in-game. I do have all the figures from the various Frito-Lay promotions stashed away. My collecting is pretty boring at this point. I got one of each playable character (either the original or a lightcore/variant). I just wanted my kids and me to have access to each character in the game, as well as all bonus levels etc. So now that the craze is over, if I find a variant for really cheap, I'll go ahead and snag it. Haven't found any chase variants yet, but that was never the intention of my collecting. The kinds of things I have gotten lately are a regular Ninjini, because I'd gotten the Scarlet version way back when, and the ssa and lighthouse Hex, because all three were on the TRU 50 cent sale. I could've bought the Solar Aurora at the target half off sale, but honestly, $7 is still too expensive when we've already got the regular. I keep my eye out at second hand stores though. I saw a Dark Blast Zone at one, and would've gotten it but they had priced it at $5, and I wasn't even interested in paying that much. I have gotten some goodies there though. Arkeyan crossbow was only a buck. Wouldn't have otherwise gotten bonus arenas, but that one was fun. rarely. whenever i go to a store, i always check for chases, but that's it. thank god no!.. im done collecting. I’m considering completing the collection, except maybe the Yawn Traps. Got all these for $1 each at TRU today! My local TRU had a bunch of 'landers for $0.79/ea last weekend. Picked up Imaginators Starter Pack for Xbox One at Five Below for $5 this past weekend. Thought about picking up a Superchargers Xbox One portal so I could eventually scan in traps, thinking it would only be a few dollars on eBay. Turns out Xbox One portals are hard to find I guess. Cheapest I saw was $12, not worth it. I'm fine with just scanning in Imaginators collection. I'm still buying rares and the odd variant. I miss the hunt for new Skylanders. But it's hard to justify spending big $ on characters when you know in all likelihood there won't be another console game with physical characters ever again. I've noticed the prices really starting to drop. I'm getting the odd good deal. Making offers and waiting until they are keen to sell. Not rushing out to buy everything I don't have because one day there will be nothing left to buy. Mind you by that time the chips will probably have started failing. Definitely looking forward to Starlink on Switch. Happy to see it’s not just in-space dog fights like I originally thought. As long as its consumer friendly (every item can be pre-ordered, release days somewhat up front, etc), I’ll collect em all.